May 31 Landmarks/Land Use Gowanus Hearing--Continued discussion with representatives of the Department of City Planning on topical issues for the future planning of the Gowanus Canal corridor. Topics to be addressed at this meeting include the prioritization of the Guiding Principals and how they relate to the land use framework. The meeting will take placed at P.S. 32, which is located at 317 Hoyt Street (Union & President Streets). The start time is 6PM. 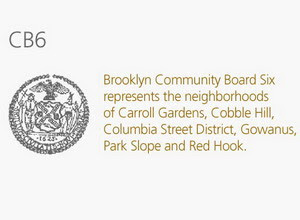 June 13 General Board Meeting--The General Board Meeting of CB6 will take place in the Auditorium at John Jay High School, which is located at 237 7th Avenue (between 4th & 5th Streets). The start time is 6:30 PM.